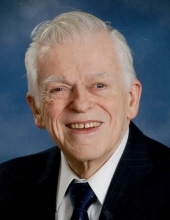 Celebrating the life of Theodore Edward Ekstrom, Jr.
Obituary for Theodore Edward Ekstrom, Jr.
Family and friends of Theodore E. Ekstrom will gather at 9:45 A.M. Saturday, January 19, at Queen of the Rosary Church, 750 W. Elk Grove Blvd., Elk Grove Village, for Mass at 10:00 A.M. Interment will be in St. Michael the Archangel Cemetery, 1185 West Algonquin Road, Palatine. Visitation will be from 3 to 8 P.M. Friday, January 18, at Glueckert Funeral Home, 1520 North Arlington Heights Rd., Arlington Heights. Born May 8, 1928, in Chicago, Theodore died peacefully at his home on Saturday, January 12, 2019. He was preceded in death by his beloved wife, Alice. Theodore was the loving father of Ann (Peter) Feehan, Catherine Ekstrom, and the late Edward T. Ekstrom; cherished grandfather of 8; dear brother of Rosemary (Robert) Hamilton, and the late Joan (Richard) Lynch, and Katherine (Gerald) Duffy. In lieu of flowers, memorial contributions to: Research to Prevent Blindness, 360 Lexington Ave., Floor 22, New York, New York 10017-6528. Phone: (800)621-0026, (212) 752-4333. 750 W. Elk Grove Blvd. "Email Address" would like to share the life celebration of Theodore Edward Ekstrom, Jr.. Click on the "link" to go to share a favorite memory or leave a condolence message for the family.